You have seen him shredding on his guitar for years now with super group Metallica, but did you know that Kirk Hammett has a dark and sinister hobby? He has been collecting horror and sci-fi memorabilia since his youth and now he wants to share it with you. Kirk has just released his new book It’s Alive! showcasing his amazing collection of classic horror movie posters. And if that isn’t enough, the Peabody Essex Museum in Salem, Massachusetts is hosting an exhibition of over 135 works in Kirk’s collection. Check it out through November 26, 2017. FrightFind had the chance to pick Kirk’s brain and find out what’s going on with It’s Alive! FrightFind: What is It’s Alive! and what are you hoping readers take away from it? 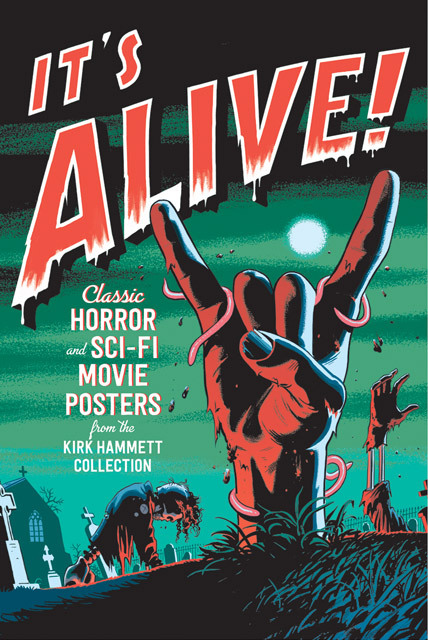 Kirk Hammett: It’s Alive is my museum exhibition of my horror movie memorabilia collection. The very first museum show of its kind in the history of the world and I’m very proud of the fact I’m actually breaking new ground here. 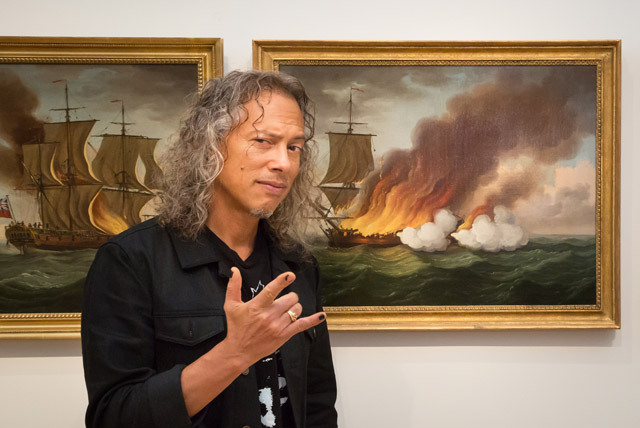 Kirk Hammett at the Peabody Essex Museum. © 2016 Peabody Essex Museum. Photography by Allison White. It’s Alive! is a celebration of the artistic and cultural significance of the horror movie poster stemming over decades of time and how impactful these images and this artwork have been on modern culture since the beginning of the age of the horror film – I would say in the teens and the twenties – there has not been any sort of real significant and validation that has ever been done on how beautiful and how artistically great horror movies posters are and have been and so this is a celebration of the beauty of my collection, more so than anything else – and how I find this remarkably significant on many different levels. Cultural, artistic, and creative levels. It’s a wonderful sort of thing I want to bring other people in to. And include other people in on. FF: What was the first piece of horror memorabilia that started your collection? KH: Well, I went through a dry period in my collecting when I was a child. I basically stopped collecting stuff when I was twelve or thirteen years old because we had moved out of San Francisco and I’d moved to the suburbs where I didn’t have access to comic book stores. So I ended up being an adolescent in the suburbs with nothing to do. I had whatever stuff was available to me at the time which was watching horror movies on tv and going to the movie theaters but I discovered something else that really took up most of my free time, and that was music. So I went through a dry period between the time I was a kid until the time I was a young adult. In that time period music completely took over my life. I’d say 90% of my life. But I still had a foot in the horror genre. I was still watching horror movies, still reading horror books, still buying the odd monster magazines and comics. The Bride of Frankenstein, 1935, produced by Universal Pictures, lithograph, 26 1/2 x 40 5/8 in. (67.3 x 103.2 cm). Courtesy of the Kirk Hammett Horror and Sci-Fi Memorabilia Collection and Universal Studios Licensing, LLC. When I got a little bit of disposable income around 1985 I jumped right back in again and the first thing I did was I went down to my local comic book store and I bought a bunch of vintage horror comic books and I took them on tour with me on the ride the lightning tour and I would read them with much pleasure because it was great knowing I actually generated this money through playing my guitar and playing my music to feed my other muse, which was horror. I was back on track from that point on. I started buying horror comic books, toys, props, masks, posters … then around 1989 I remember buying a Bride of Frankenstein half sheet, it’s the one at the Peabody, actually, and just staring at it going my god that’s so beautiful. The images are so iconographic, and it puts so many wonderful thoughts in my head. It was so inspiring. And from that point on I dived head first into to the movie posters. And out of all the stuff, I collect it’s the movie posters that mean the most to me and have the most significance to me outside of the actual movies themselves. FF: With most collections, it’s not the pieces you have but the ones you don’t that keep you collecting. Are there posters you are still after? KH: Well, you know in the movie poster world it’s high and dry. It’s not like the comic book world where there’s 10,000 copies of Spider-Man number one. There might very well be 10,000 copies of Spider-Man number one. But a Frankenstein one sheet poster from 1931? There’s only 5 known to exist. And there’s a multitude of horror movies that have no posters that have been found to be attached to them. A good case in point – The Mask of Fu-Manchu. A universal horror picture from 1934 or 1935 and there’s maybe one or two big pieces of paper that exist from that film. Another example, Murder in the Rue Morgue, 1932. There’s maybe three pieces that exist from that film. So there’s a multitude of stuff that is not known to exist until it’s found. Attributed to Karoly Grosz, The Mummy, 1932, produced by Universal Pictures, printed by Morgan Lithograph Company, lithograph, 41 × 27 in. (104.1 × 68.6 cm). Courtesy of the Kirk Hammett Horror and Sci-Fi Memorabilia Collection and Universal Studios Licensing, LLC. 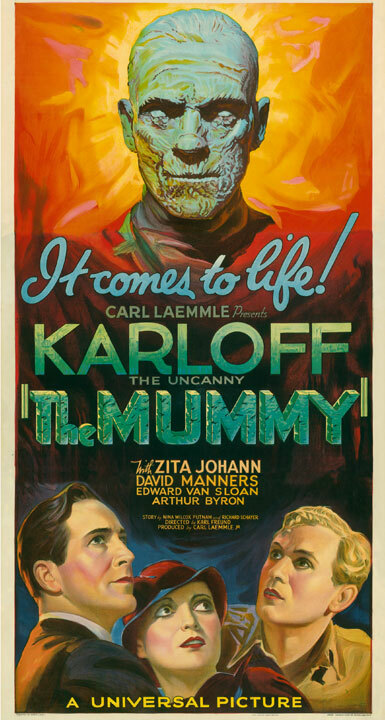 Another case in point is my Mummy three-sheet. That is a one of a kind of piece it wasn’t even found in the States it was found in Sweden. And when something is discovered, and it’s significant, it causes huge ripples in the hobby and all the collectors learn about it within days. So there is a lot of stuff out there that still needs to be discovered. I have a feeling there’s stuff out there a lot of collectors want that will never be found because it just doesn’t exist. But we don’t have any quantifiable answers to any of this because this stuff is so rare. When the stuff comes up, it’s a huge event, and everyone shakes their head, going ‘Wow! Fantastic! One has survived’ and then the race starts on who actually is going to acquire the piece and that gets a bit cut throat. Then there’s a lot of detective work, a lot of investigating, following leads, dead-ends. Then there’s a bona fide find and when someone actually finds a cache of movie posters, especially say a pre-war, pre-1943 or 44 it’s a big deal. Because it’s pretty much a given that it doesn’t exist or didn’t survive. So when a piece comes through there’s a lot of surprise and shock, but there’s celebration and fanfare at the same time. People staring at the image and digesting and taking it apart. It’s an interesting hobby, to say the least. FF: So what would be your Holy grail of posters? Would it be from the pre-war period? 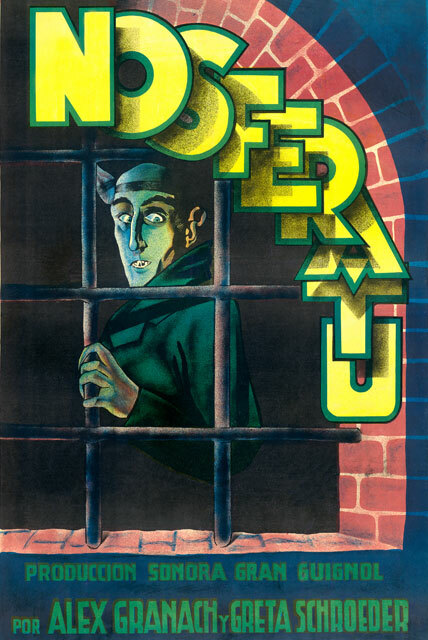 Nosferatu, about 1931, produced by Prana Film, Germany, printed in Spain, lithograph, 42 1/4 x 29 1/8 in. (107.3 x 74 cm). Courtesy of the Kirk Hammett Horror and Sci-Fi Memorabilia Collection. It’s significant, because it’s a color image of Nosferatu, whereas no one really ever sees color images of Nosferatu, ever. It’s always the same old black and white images. Well lo and behold, I have a color image of Nosferatu and it was made by the production company that had to do with the film. And so the colors are most likely very accurate from what they were during filming and that in itself relays so much information on the character of Nosferatu, the production of the film, what the colors actually were. Because it’s hard to glean what color is what because it’s all black and white. So the movie poster of Nosferatu is not only a great graphic and beautiful, but it also informs myself on the film itself in a lot of very subtle ways. 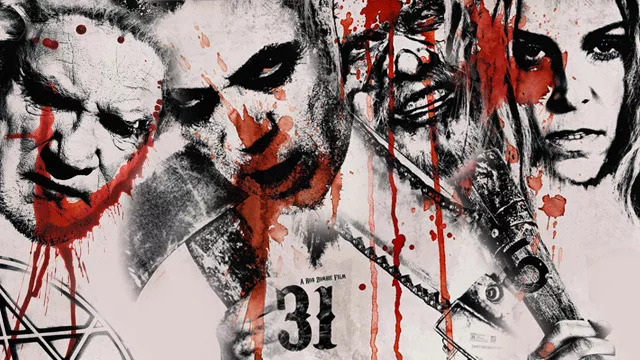 FF: How much, if at all, have horror movies influenced your musical career? KH: Well, let’s just put it this way … in the area where I have all of my best movie posters I also have an amp and a guitar, and it has been that way for the last twenty-five, thirty years. All I have to do is go into that room, and I just sit there and I play guitar and stare at my movie posters and I’m inspired. I can stay in that room forever, it’s the greatest thing. It’s nothing in particular, but it is a general sort of muse for me, a general source of inspiration. 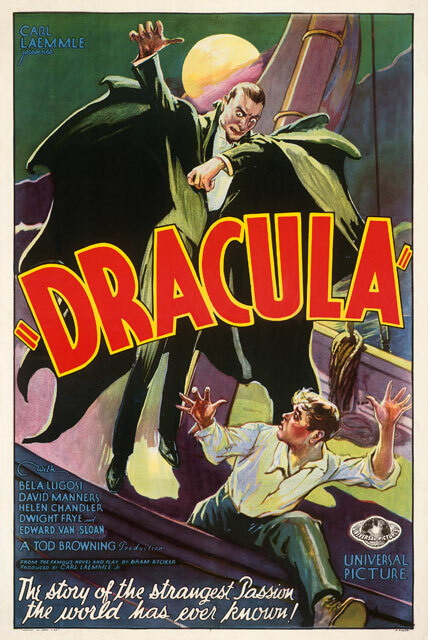 Dracula, 1931, produced by Universal Pictures, printed by Morgan Lithograph Company, lithograph, 41 × 27 in. (104.1 × 68.6 cm). Courtesy of the Kirk Hammett Horror and Sci-Fi Memorabilia Collection and Universal Studios Licensing, LLC. At the same time, I can’t draw a correlation saying this Frankenstein meets the Wolfman poster is responsible for this riff I’m going to call the Frankenstein meets the Wolfman riff. That doesn’t happen. What happens is I sit in my movie poster room where I’m very inspired and very comfortable. It’s a very safe place for me creatively, mentally, and spiritually. I sit there and I create, and that’s the impact these movie posters have on my own personal creative muse. FF: What’s your all time favorite horror film? KH: Okay, that’s a hard one to answer. Like who’s your favorite kid or what’s your favorite song. What’s your favorite food. It changes all the time. I might give you an answer this week but it might be completely different next week because I read an article about a movie and watched it and got super enthusiastic about it, and it gets in my brain so it’s all I talk about for a while. But yeah, I do have a handful of films that I continually go back to, and they’re almost exclusively classic horror movie films. There’s something about that era that always pulls me back. I mean I’ve seen Bride of Frankenstein over 100 times. The Black Cat I think I’ve seen 75 times. The Mummy I must’ve seen over 100 times. Frankenstein, Dracula, I’ve seen both of those movies easily over 50 times each. And I love them, I love them still. I love The Golem, The Cabinet of Dr. Caligari, I love Nosferatu, and then I love a lot of cheesy stuff from the 50’s. Invasion of the Saucer Men is one of my favorite films, Invaders from Mars is one of my favorite films. 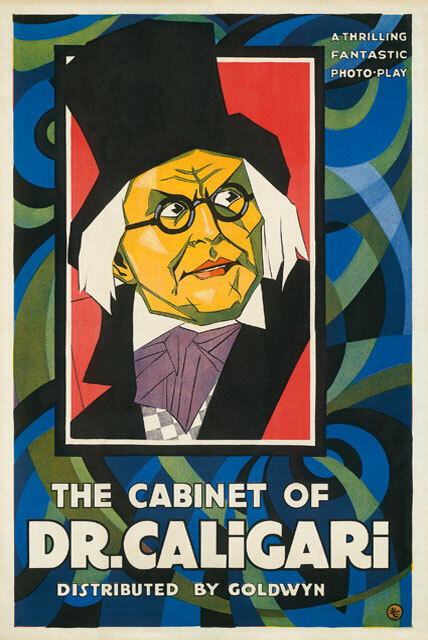 Lionel Reiss, The Cabinet of Dr. Caligari, 1921, produced by Decla-Bioscop, Germany, printed by H. C. Miner Lithograph Company, lithograph, 41 x 27 in. (104.1 x 68.6 cm). Courtesy of the Kirk Hammett Horror and Sci-Fi Memorabilia Collection. The Black Sleep, which is a weirdo B-movie, or C-movie, that nobody ever gives any significance to is one of my favorite films. We go into the 60’s and I love Rosemary’s Baby. I think that’s such a great film. Then there’s the great Hammer stuff from the 60’s. Then the early 70’s when I was a kid and going to the movie theater, one of my all-time favorite movies is a movie called Equinox, I love that film. I love it so much, I tried to find anything about that movie, and I think I’ve gotten everything on that movie and I’m squeezing the rag trying to get as much as I can out of this Equinox film and I just can’t get enough. So what’s my favorite horror film? That’s a hard one to answer because I have more than a handful. I love the film Re-Animator, I love the Evil Dead series, I love the Hellraiser series. I love werewolf films, I love films about Bigfoot and giant monster films. So I can’t really answer that question. FF: What do you think about all of the recent remakes and reboots of classic horror films? Are there any that you really liked? Is there a film that would excite you if they did remake it? KH: A lot of it kind of reeks of product and creating commodities. Remakes, I don’t know. My whole thing about remakes is kind of similar to my thing about cover songs. Why cover a song if you’re going to make it exactly like the original? The world already has the original. Does it need another? If you’ve got a piece of music and you want to cover it, make it different. Put your own personality on it. Put your own stamp on it. Take it to another place. A lot of these remakes are watered down versions of the original. There are exceptions, like The Thing – the one that came out 4 or 5 years ago, it’s not a remake, it’s a prequel. I think that’s a great idea. The Evil Dead movie, I’m sorry to say, I had high hopes for it, but I found it to be a watered down version of the original, so did we really need it? That’s what I look at, that’s my criteria. There are some remakes that do a modern perspective, or are entertaining but are completely different from the original. Like Kong: Skull Island. I thought it was a pretty good retelling, a modern take on the original Kong, but it’s still completely different so I can’t compare the two. I have to kind of take every remake on its own individual basis and make up my own mind about it. FF: What’s next for you? Any new projects? Anything in horror? KH: The hope is to take the collection to more venues around the world, across the States, across Europe, across Asia. I would love to see it take on a life of its own. The focus is on the collection right now but.. maybe there will be more books coming. 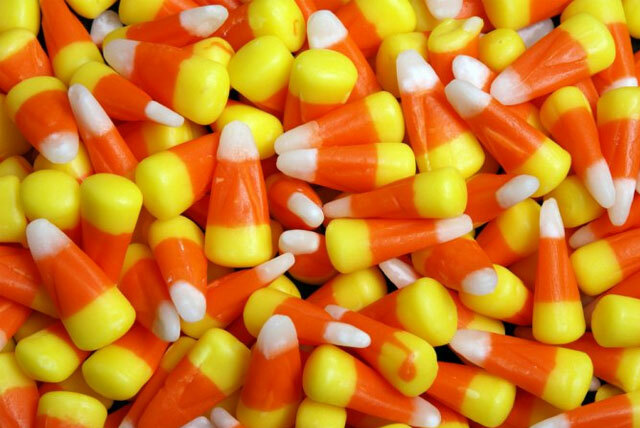 FF: What is your favorite Halloween candy? KH: I guess it has to be that Halloween corn, you know, candy corn. Those orange, white, yellow things. Only because the sight of them brings back so many Halloween memories as a kid.